For this week's #TacoTuesday, I cooked up what just might be my favorite tacos to date. 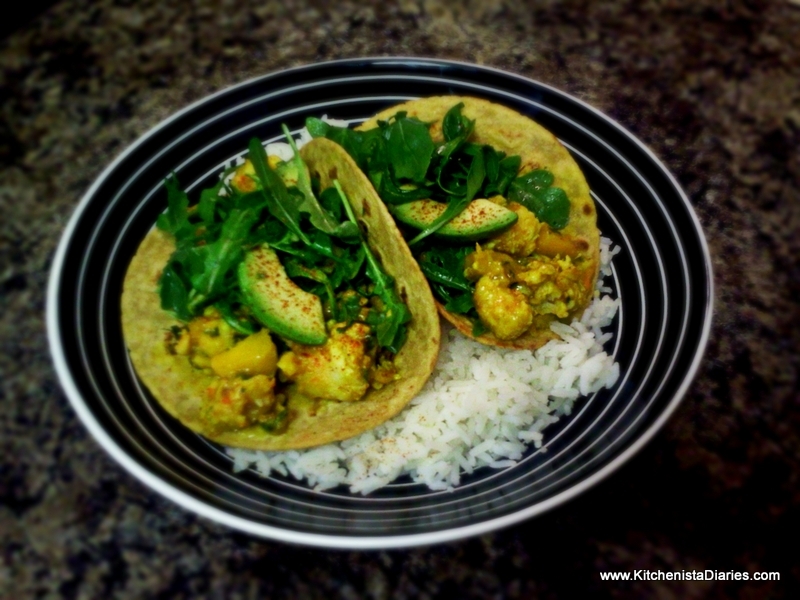 After a few days of cooking some Thai-inspired curry dishes, I decided to keep the momentum and include those flavors in a taco dish. 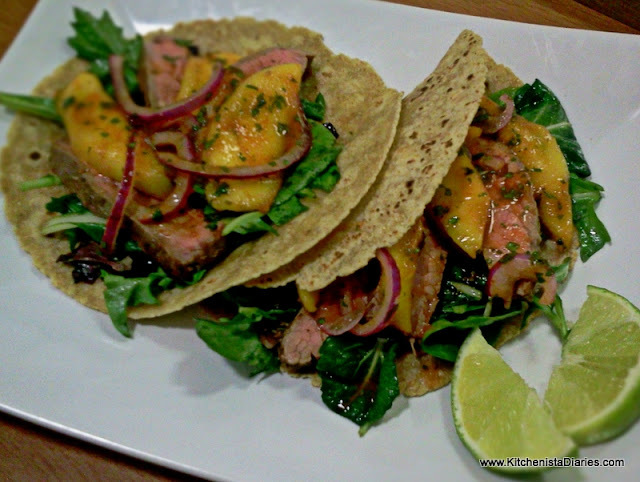 The idea for the mangoes came from my coworker, who raves about the Central American preparation of under-ripe mangoes with hot sauce, lime and salt. I turned my nose up the first time but had to admit I was intrigued. He was right. 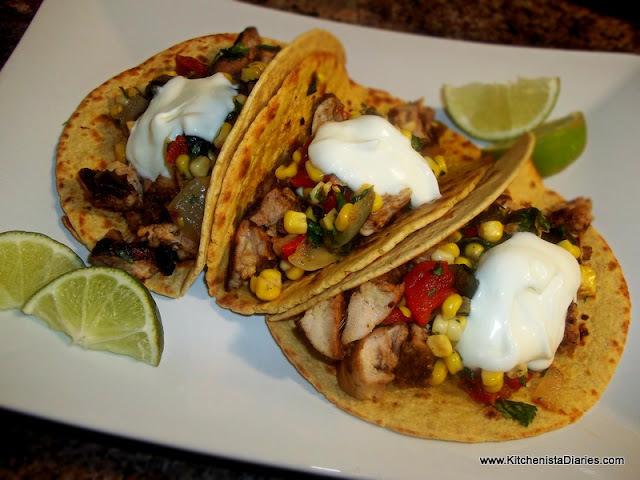 You don't need to worry about any exact measurements for this recipe, so adjust all ingredients & seasonings to taste. I had fun with this one and I think you'll love the result. By the way, this was my first time cooking steak! I got a lot of info from The Food Lab's guide to properly slicing meat against the grain for tender pieces of flank steak. *I used an indoor grill (George Foreman) and was pleased with results. Any kind of grill will work so long as it's hot enough to quickly sear the steak. You could probably achieve decent results broiling the flank steak in a pinch, but I haven't tried that myself. 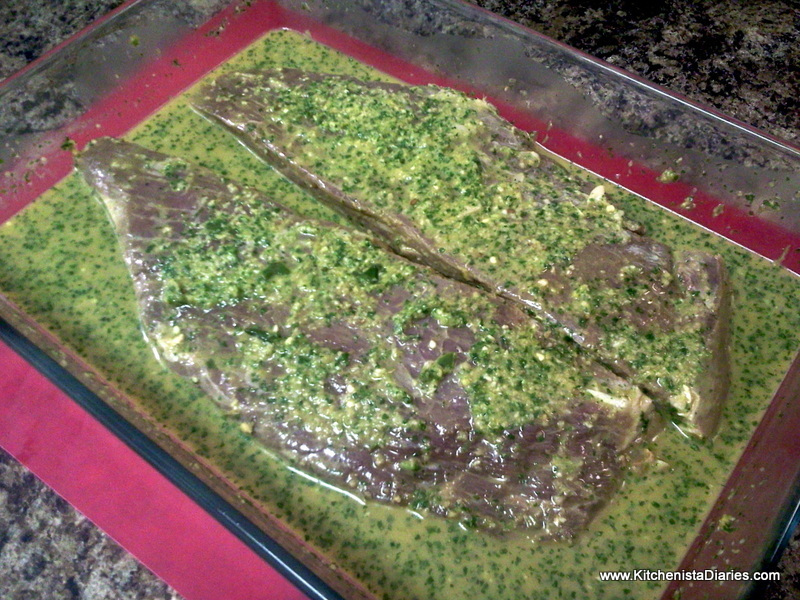 First, prepare a marinade for the flank steak. 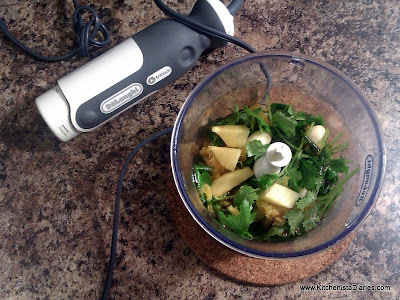 In a food processor, throw in a generous amount of cilantro leaves & stems, the juice of half an orange, juice of 1 or 2 limes, several cloves of peeled garlic, a few pieces of fresh ginger (I used about a 1 1/2" knob), two or three Thai chilies and a couple tablespoons of olive oil. 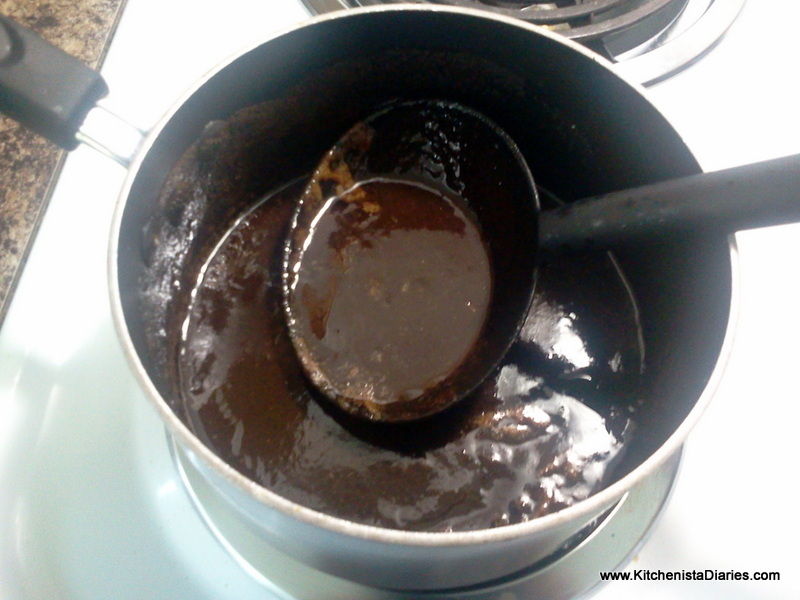 Add a couple tablespoons of soy sauce and about a tablespoon of fish sauce. Puree, then taste your marinade and adjust seasonings if necessary. You may need to cut your flank steak along the grain lengthwise to fit your grill. If necessary, trim any excess fat. In a non-reactive pan large enough to lay the steak in one layer, pour the marinade over the steak. 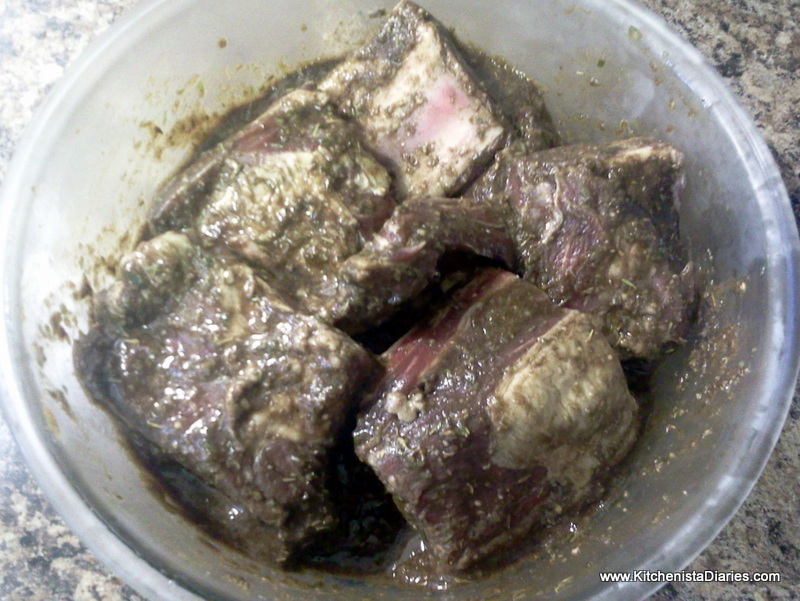 Cover and marinate at least 30 minutes at room temperature. I marinated mine about an hour. Flip the steaks over halfway through. Peel and slice the mango. 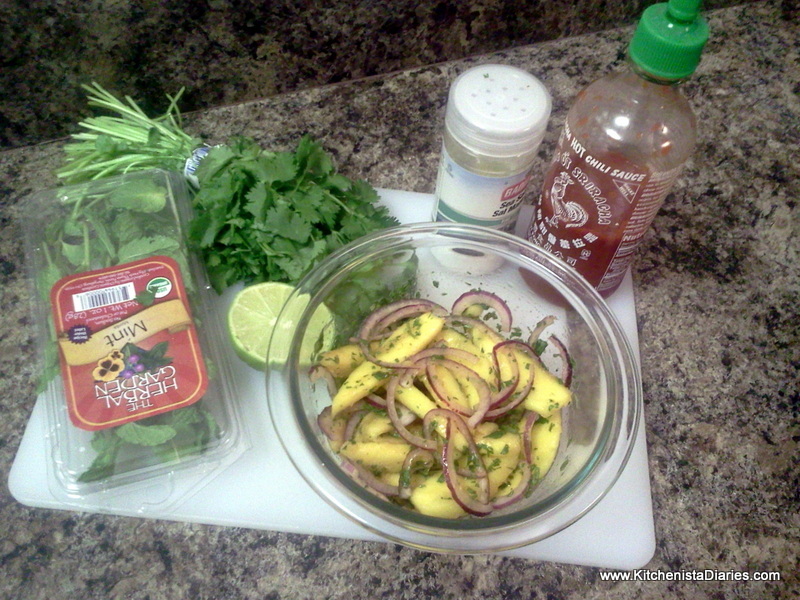 In a small bowl, combine mangoes with thin onion slices, juice of half a lime, plenty of Sriracha sauce, chopped cilantro & mint, and a little sea salt. Toss to coat mangoes and refrigerate until needed. I prepared the vinaigrette ahead of time, but did not toss it with my greens until serving the tacos. This prevents everything from getting soggy. In a small bowl, whisk together the juice of half an orange, a few tablespoons of honey-infused olive oil (or olive oil + a drizzle of honey). Add sea salt & pepper to taste. Make sure your grill is preheated; it needs to be extremely hot. Drain the marinade, scraping off excess cilantro from the flank steak. 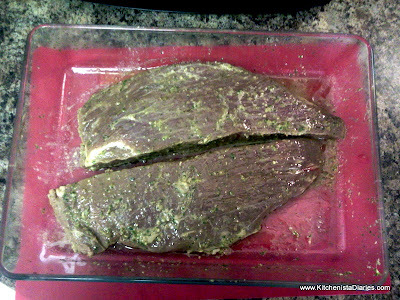 Rub both sides of the steak with a little olive oil & season with salt and pepper. Grill the steak. You're looking for a rare to medium rare finish for best results; medium is probably okay but I wouldn't go past that. The internal temperature of the steak should be at least 125° for rare; about 140° will get you to medium. I reached 125° after 5 minutes on the grill. Keep in mind I'm cooking for those of us in apartments using George Foreman Grills, which worked fine by the way, although I'm sure a charred steak would have been fantastic! If you're using an outdoor grill (or an indoor grill that is not 2-sided) you will need to adjust the cooking time appropriately, flipping your steak half way through. I would estimate grilling time of 4-6 minutes per side. When your steak is grilled to perfection, remove it from the heat and allow it to rest, at least 5 minutes before slicing! This is the most important tip I've ever picked up about cooking most meats. 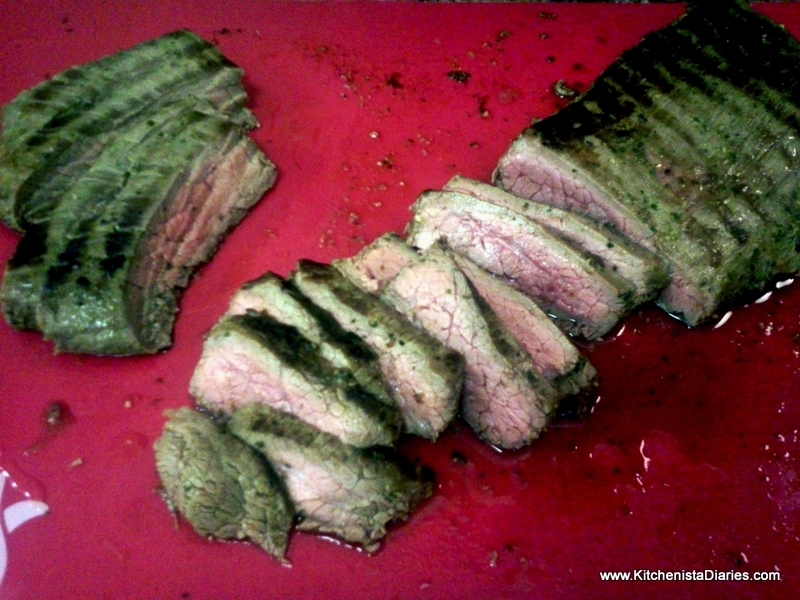 If you cut it too soon all of the juices will run out and you'll end up with dry steak. While the steak is resting, warm your tortillas and toss the mixed greens in the vinaigrette. 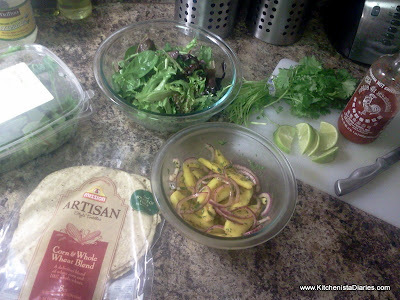 You don't need much, the idea is just to add a hint of flavor to compliment everything else going on in the taco. 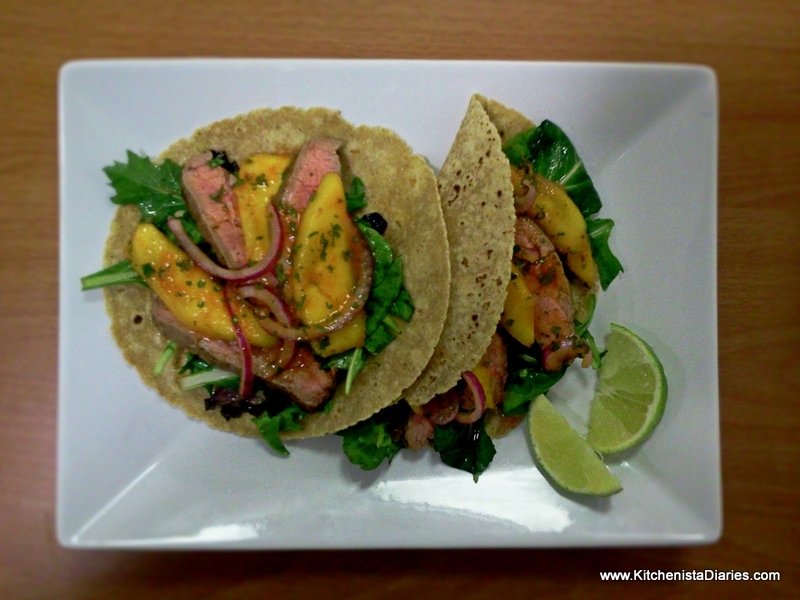 To serve tacos, I placed a small handful of greens in a warm tortilla, and topped with alternating pieces of steak and spicy mango. Finish with some onions and garnish with a few cilantro leaves if desired. 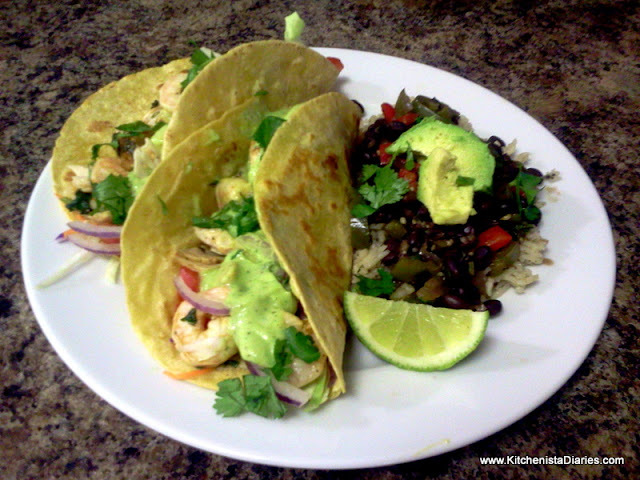 Serve with plenty of limes and if you like it really hot, some extra Sriracha sauce on the side. Enjoy! Tonight's dinner was nothing short of fantastic. I rarely cook beef (read: never) so this was a bit of a leap for me and one I'm glad I took. A girl can only eat so much chicken and seafood. I browsed the web all morning for ideas as to how to cook short ribs and most of them involved some type of red wine sauce with a couple herbs for good measure. I'm sure they're all quite good but I was hoping for a bit more drama on my plate. 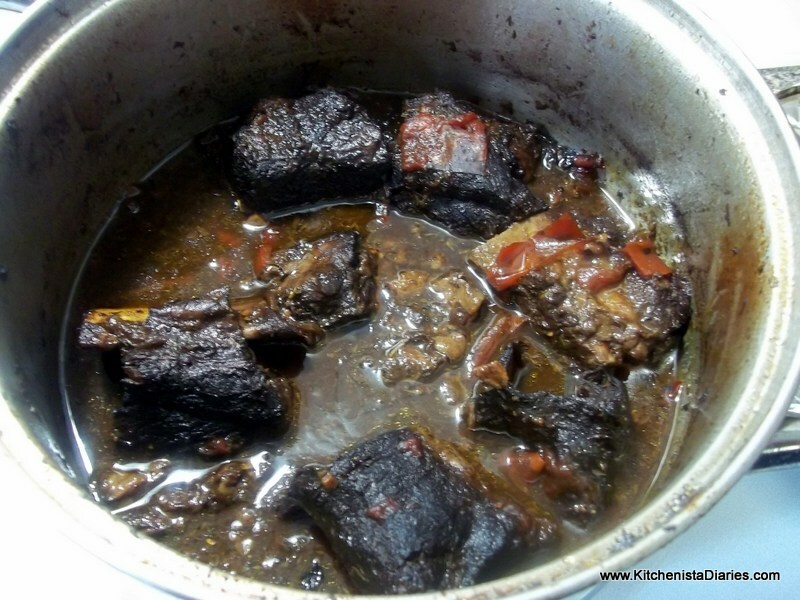 I had some plantains sitting on my counter that I really wanted to use, so I thought a Caribbean version of short ribs would be perfect. 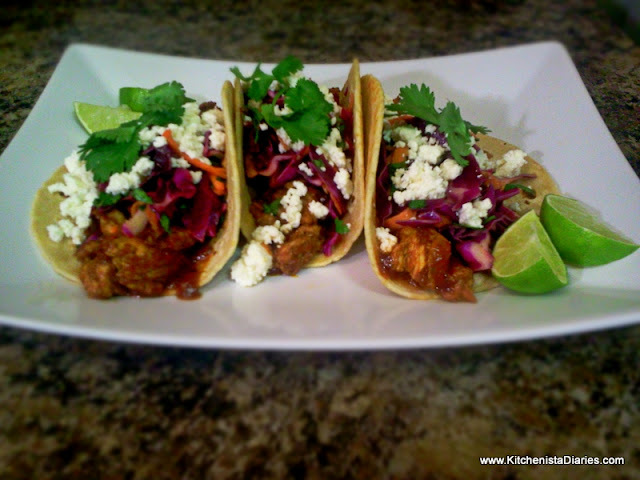 I came across this recipe that used a jerk marinade and knew I was onto something. I'll admit, the idea of adding coffee to a red wine sauce scared the hell out of me and I almost considered taking it out altogether. 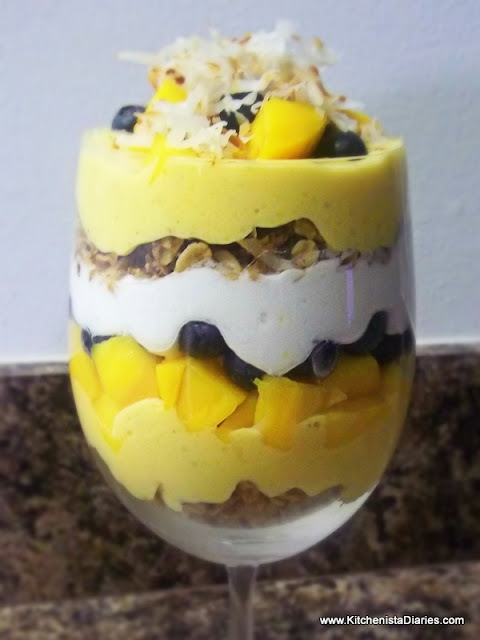 But I was fascinated, and after a few modifications to the recipe I knew I was on the right road. I stayed mostly true to the core of the recipe, modifying the marinade to include some things I usually put in my jerk sauce. I also added broth and a touch of brown sugar to even out the sauce for the ribs. Gotta say I'm pretty proud of this dish so I'm excited to share it with you! Combine all ingredients for the jerk marinade in the food processor and blend until smooth. 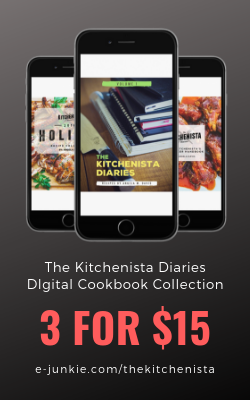 Adjust seasonings to taste, all measurements listed are approximate. 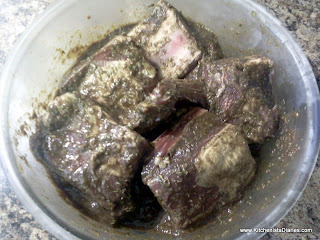 Pour marinade over the beef short ribs in a nonreactive container, toss to coat ribs. Cover and refrigerate for at least an hour. Preheat oven to 300°. In a large Dutch oven pot heated to medium high, add oil. Once hot, add short ribs meat side down. Reserve the remaining jerk marinade. Unless you have a huge pot, you will probably need to sear your ribs in batches, so don't crowd the pan. 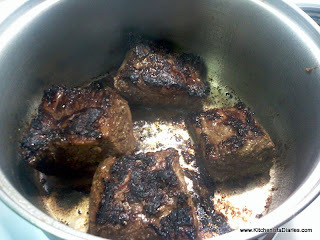 Allow short ribs to sear for approximately 5 minutes on each side, forming a dark caramelized crust. The bottom of the pan will start to blacken, this is normal so don't be alarmed. Remove the first batch of ribs from the pot and set aside, continue with remaining short ribs until all are seared. 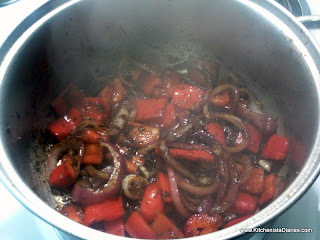 Reduce heat to medium and cook reserved jerk marinade, onions, garlic and red peppers until softened, approximately 10 minutes. Increase heat to medium high. Add wine, coffee, and chicken broth. Deglaze the pan, being sure to scrape up all the little bits of browned vegetable and beef; this adds a ton of flavor to the sauce. 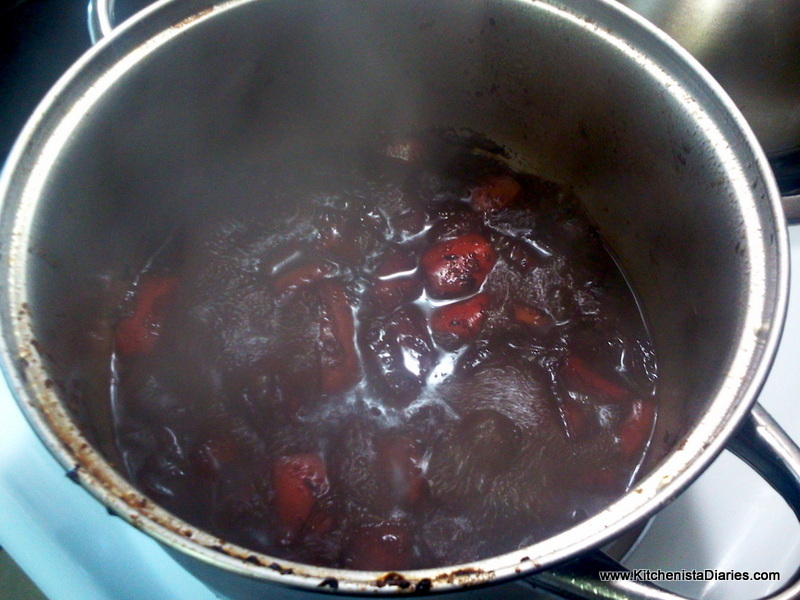 Bring to a boil and continue cooking until liquid reduces by about half, about 10 minutes. I tasted my sauce at this time and found it to be a little bitter, so I added the brown sugar at this point. Depending on the wine used and strength of the coffee, you may or may not feel the need to do that. The biggest tip I remember learning about making wine sauces is not to cook with a wine you wouldn't drink. There are great red wines for $5-8 bottle, so don't bust your budget on a sauce. I also added a pinch of cinnamon and cloves, and sea salt and black pepper to taste. Return the short ribs to the pot, meat side down in the liquid. If necessary, add enough chicken broth to cover short ribs. Cook for 5 minutes or so on medium high heat. Cover tightly and transfer the pot to the oven. The pot I was using was ovenproof, however the glass lid was not, so I just wrapped the pot tightly in aluminum foil and this worked fine. The ribs will need to cook for 2 -3 hours depending on size, so there is no exact time a recipe can provide. The meat will start to fall off the bone about half way through but that doesn't mean that they are done. At the one hour and two hour mark, turn the ribs over. Continue cooking until the beef is tender, you shouldn't even really need to use a knife to eat these once done. 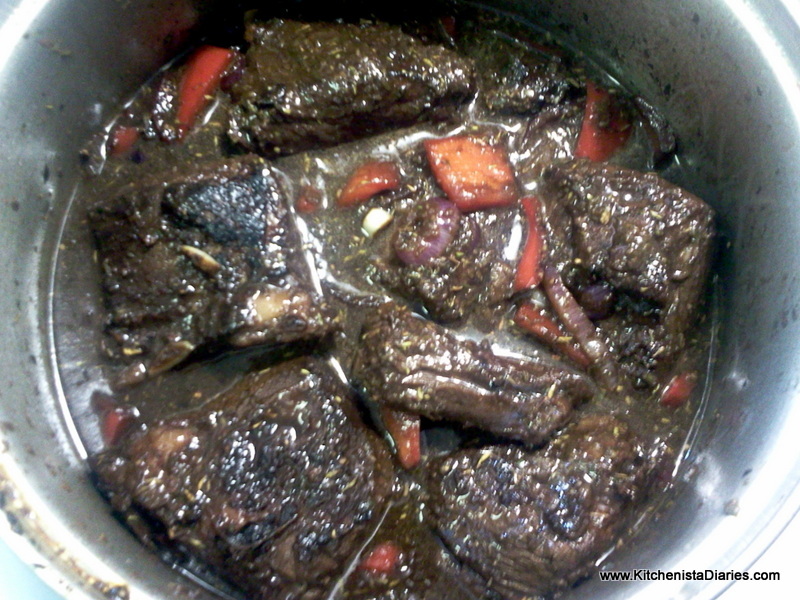 When short ribs are cooked, remove from oven, uncover and allow to rest for several minutes until serving time. You can skim off some of the oil as the pot starts to cool. I wanted to make a sauce a little bit thicker to serve my ribs, so I transferred about 2 cups of the liquid to a sauce pan. Over medium high heat, I cooked the sauce until it had reduced by about half. 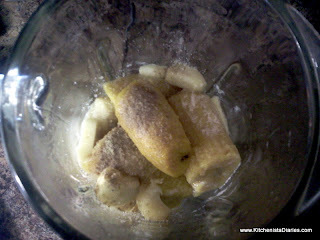 I then added a squeeze of fresh lime juice and used an immersion blender to puree until smooth. 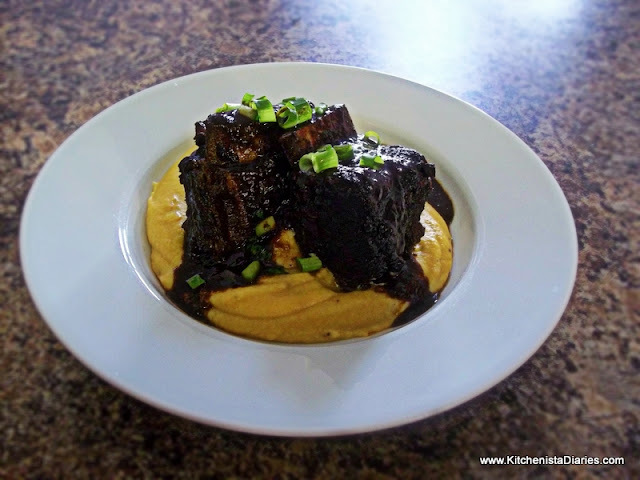 The short ribs would be great over rice or even sweet potatoes, but as I said I had some plantains to use up so I made a quick puree. 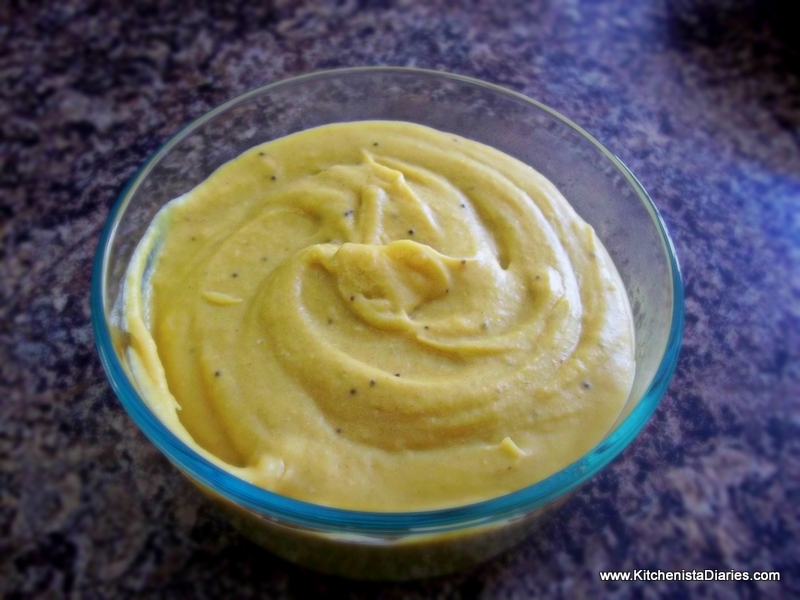 The recipe for my Plantain Puree can be found in the previous blog entry. Enjoy! Tonight's simple side dish was somewhat experimental, resulting in a new favorite way to enjoy plantains. This makes a great healthy alternative to mashed potatoes as it has much less butter and no cream or milk added. The plantains used should be ripe with bright yellow skin mottled in black. 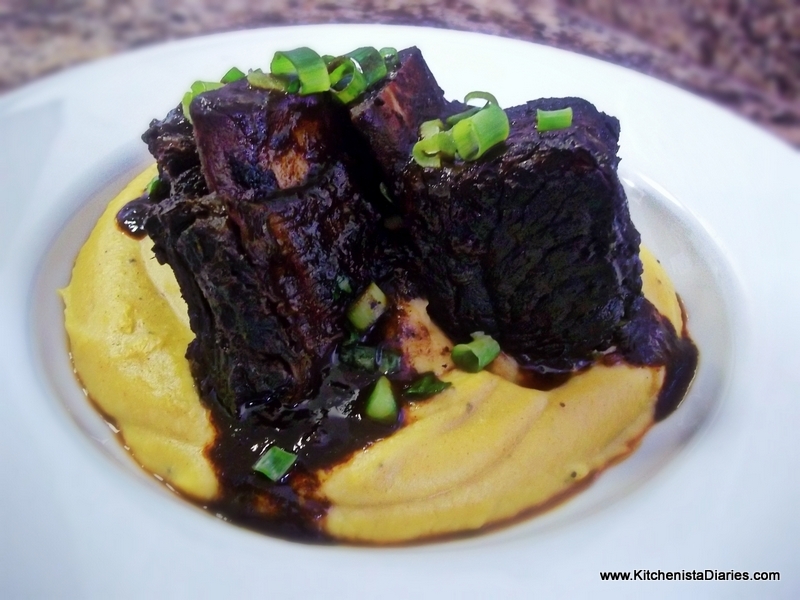 The sweetness of the puree makes it a great side for rich or spicy meat dishes such as the Jerk Braised Short Ribs I served tonight. 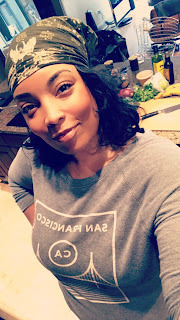 I like to roast a whole head of garlic in the oven while I'm cooking other foods, that way I can refrigerate and use as needed without additional prep. *If you do not have roasted garlic on hand, take a whole head of garlic drizzled in olive oil and wrap it in aluminum foil. Roast at 400° for 20-30 minutes until cloves are soft. Peel plantains and cut into quarters. Add to a pot of boiling water and cook until soft, approximately 20 minutes. 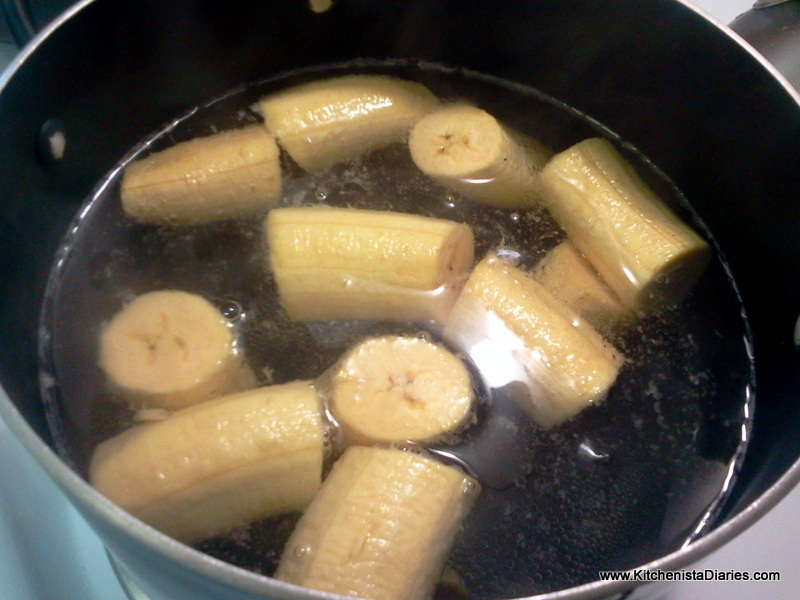 Plantains will turn a golden yellow color when cooked. Transfer plantains to blender and allow to cool for a couple minutes. There's no need to drain them, a little bit of the plantain water actually adds to the puree. Add garlic cloves, butter, sea salt, and white pepper. Puree plantains, adding just enough of the chicken broth to make the puree smooth and creamy. Serve hot. Here's another summer recipe that should make even the pickiest eater happy. 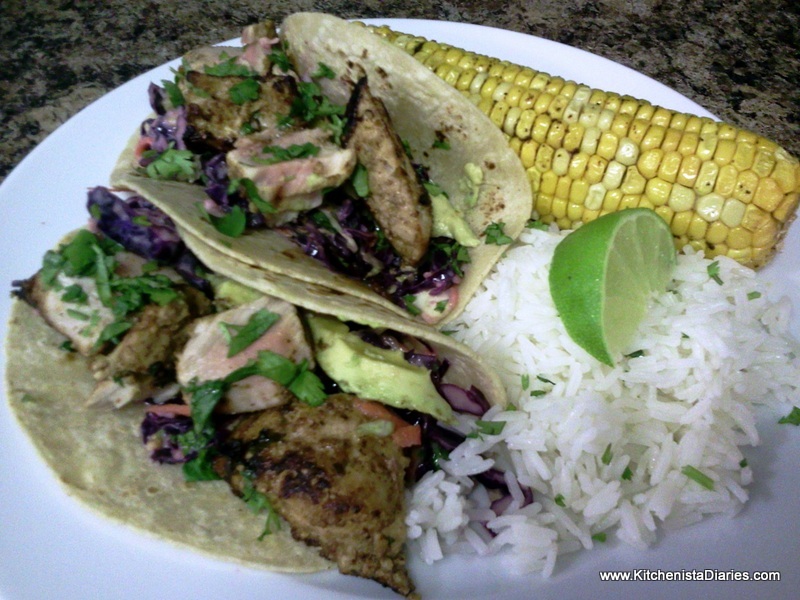 Fresh salmon fillets are marinated in a smoky spice blend and then grilled and flaked to fill warmed corn tortillas. The salsa is a cool and refreshing mix of cucumbers, avocados and diced tomatoes with plenty of lime and cilantro. To top off the tacos, I made a tangy dip with yogurt, lime and cilantro which is so much healthier (and tastier!) than sour cream. I used an indoor George Foreman grill for my salmon, so adjust cooking time if using an outdoor grill. You could also sear these in a stainless steel or cast iron skillet. Rinse the salmon fillets and pat dry. Prepare the marinade for the salmon by combining the smoked paprika, cumin, chili powder, lime juice and 1 tablespoon of oil. Spread the marinade over the salmon and refrigerate for 30 minutes. To de-seed a cucumber, first peel it and then slice it in half lengthwise. Run a spoon down the center of the cucumber to remove the seeds and membranes. You can then proceed with dicing it. In a small bowl, combine the halved cherry tomatoes, diced onions, diced cucumbers, jalapeno, cilantro, lime juice and lime zest. Add a pinch of salt and pepper. Refrigerate until you are ready to serve, giving the flavors of the salsa time to come together. As a tip, add the diced avocado to the salsa immediately before serving. This helps prevent your salsa from becoming guacamole! The finished salsa is best eaten the same day as the cucumbers release juice the longer it sits. I promise that you won't have problems getting rid of this! The cilantro-lime dip can also be made ahead of time. 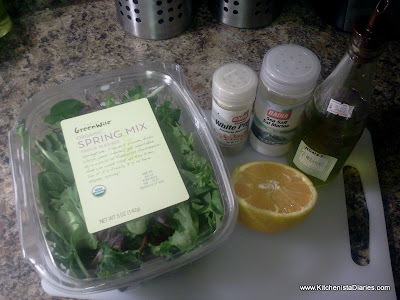 Simply combine all ingredients in a food processor, and blend until smooth. Adjust salt and honey to taste. This is a super easy recipe and a great alternative to sour cream if you are like me and need to have a creamy dip for tacos. I often change the seasonings depending on what I'm cooking, such as adding hot peppers, cumin, garlic, lemon juice, paprika etc. Warm your tortillas per the package directions. Instead of having another pan to clean, I just heated mine on the grill, using a little olive oil. Wrap the tortillas in foil and keep warm in an oven until needed. The salmon should be grilled skin side up for 2-3 minutes and then finished skin-side down until cooked to about medium, another 4 -6 minutes depending on thickness. Salmon will be opaque on the outside and a rosy pink towards the center. Remove salmon from the grill and allow it to rest for a few minutes before slicing or flaking for the tacos. 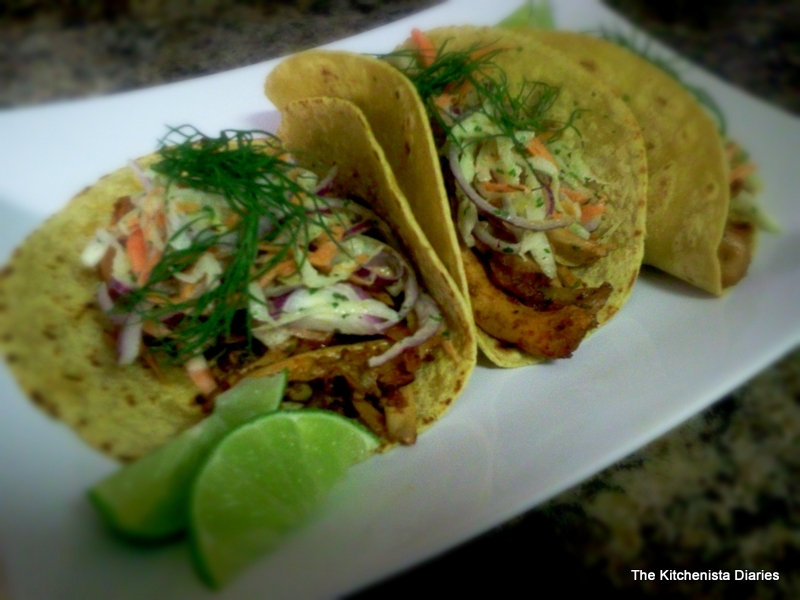 To assemble, place a few pieces of salmon into the tortillas, followed by the salsa and a dollop of cilantro-lime dip. 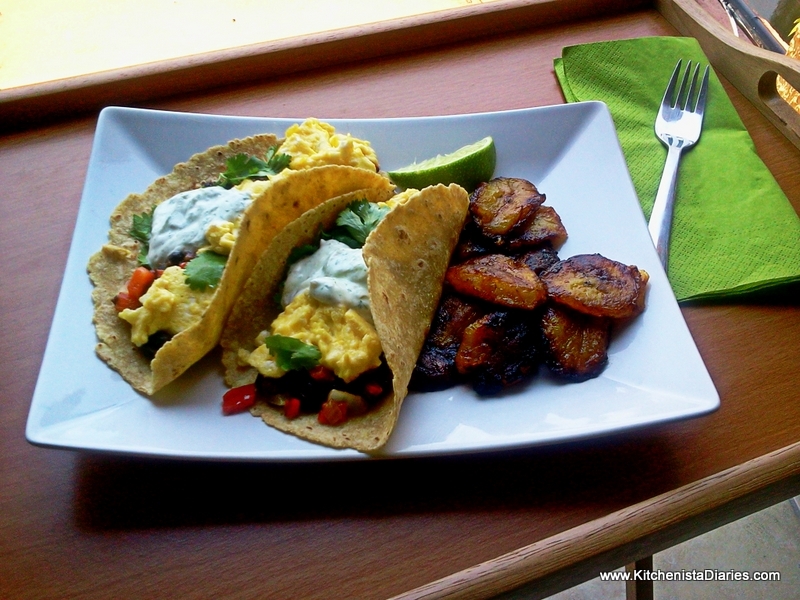 Use a few cilantro sprigs for garnish if desired.